Ships from and sold by MM Discounts in easy-to-open packaging. Ships from and sold by MM Discounts. 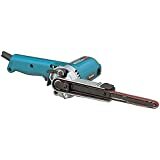 The Hitachi SB8V2 9-Amp Variable Speed Belt Sander features a powerful 9.0-Amp (1,020-Watt) motor for the toughest material removal applications with a no-load speed of 820 to 1,475-feet per minute. Ideal for wood, steel and paint removal, the SB8V2's service life is 2-times longer than standard belt sanders thanks to a wear-resistant V-belt. 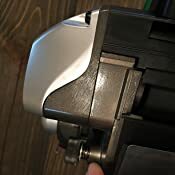 Corner sanding is improved because the dust bag is now located on the left side of the tool and the main body is flush with the belt pulley on the right. Other upgraded features include a variable speed dial, clear front cover and soft elastomer covered grip on both the main and sub handles. A dust collection bag reduces airborne particles and keeps the work area clean. 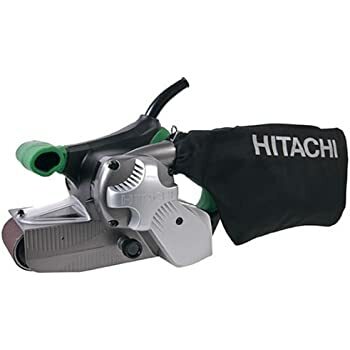 The Hitachi SB8V2 9-Amp Variable Speed Belt Sander is warranted to the original purchaser to be free from defect in materials and workmanship for a period of 5-years from the original purchase date. 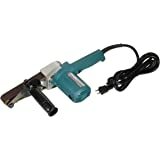 Hitachi Power Tools (Hitachi Koki USA, Ltd.) provides professional-grade power tools for a variety of applications, including woodwork, metalwork, concrete, drilling, cutting and fastening. Since its inception, Hitachi has pioneered innovative technologies that have improved the quality of craftsmanship worldwide. 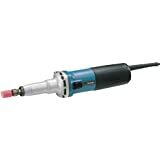 Hitachi is a leader in power tool research and development and has achieved many firsts in the power tool industry. Today, Hitachi continues the tradition of innovation and engineering with new features in addition to classic quality. People are quite right about getting an electrical shock occasionally. The problem is with the design. The combination of a plastic outer body and insulated grip handles causes static electricity to build up. Use the machine for a few minutes then ground the left side plastic cover. You will see a spark jump about 10mm. As far as I can tell the only way to safely discharge the machine is to hand it to your wife.. If she makes this sound "Aghhh" you know it has been discharged and can be considered safe..
Ok so I jest, The fact is, static electricity is not as dangerous as an internal breakdown of insulation but it does hurt and is very annoying. Perhaps one thing you might consider though is the potential of the spark to ignite solvent fumes. Hard to believe Hitachi are just ignoring the problem. Shame on them. 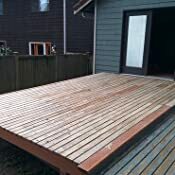 4.0 out of 5 starsUp to the task of a deck restoration project. Purchased this tool to strip several layers of paint off an old, 400 sq. ft. deck. The sander performed admirably even when pushed hard for several hours of continuous work. I did not find the tool to be overly heavy or unbalanced. Bought this to replace a RIDGID R72401. The difference between these two machines is night and day. The Hitachi is certainly heftier and bulkier, but this does not translate into any difference in maneuverability. The Hitachi is much more powerful and with excellent dust collection. With the sander hooked up to shop vac dust collection, I captured roughly 99% of the dust. Compare this to the RIDGID, which collected maybe 10% of the dust. The Hitachi also runs a lot cooler than the RIDGID, better for belt life. I read a number of low reviews prior to purchasing that complained about the Hitachi's imbalance. Yes, the weight is not centered over the platen. This did not affect stability in operation (or at rest for that matter). Really happy with this purchase. 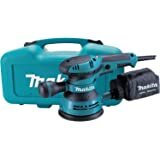 5.0 out of 5 starsQuality tool at a great price. First off, this product is of very high quality. there is no plastic, and it is heavy. putting on the belt is very easy, just pull back the lever , put in the belt, and lock the lever. I really like the adjustment knob, so easy to use. Set it and forget it. 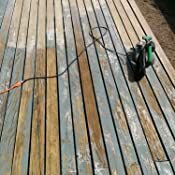 As far as sanding, it does an excellent job, you just let the sander do the job and guide it. don't need to put pressure on it as it is heavy enough to sand. One of the best tools I own. 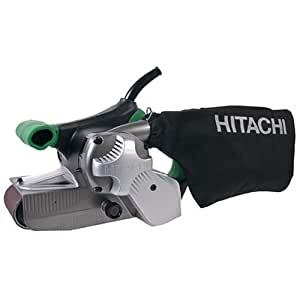 If you want a quality, high-performance belt sander, buy the Hitachi. 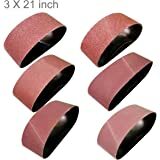 I was contemplating buying another cheap, no-name belt sander and I'm glad I didn't. 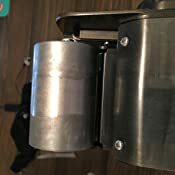 I've used many cheap belt sanders before and am familiar with the performance. So I was curious to see how good the Hitachi would be and if spending more was worth it. Right out of the box, this machine says quality. It is well-built. A robust design with a metal frame and a comfortable, rubberized grip. It is built to last. Controls are great. 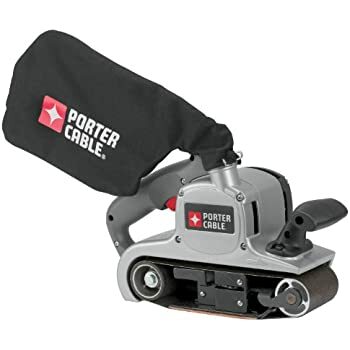 It is loud, like most power tools, but not as loud or as harsh of a noise as cheap belt sanders. 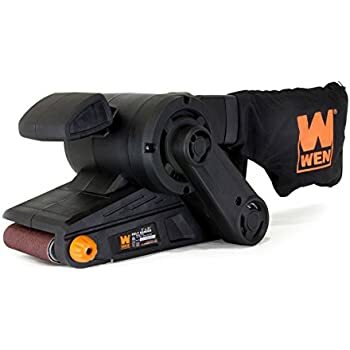 Dust collection is adequate with a huge dust bag; it captures most of the fine dust and has plenty of capacity for long periods of sanding without stopping. 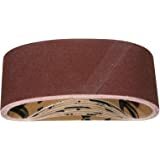 Belt tracking with a good 3M belt is excellent and it operates for the life of the belt without any adjustment. Variable-speed is a nice feature, but I mostly just run it at max speed since my goal with a belt sander is removing material quickly. 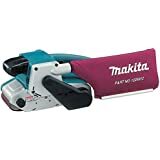 However, this machine is so powerful and fast that slowing it down can be really useful at times for a final pass before switching to a finish sander. 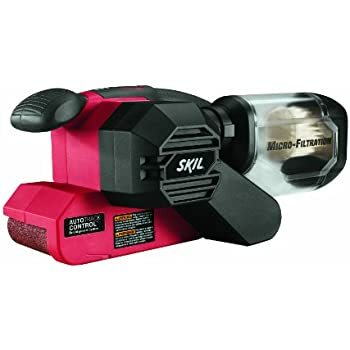 Sanding speed is the biggest operational benefit of this machine over cheap sanders. The belt speed is at least 50% faster than any of the cheap alternatives. Sand with the Hitachi at max speed for 30 minutes, then go to the slowest speed, which is equivalent to the max speed of a cheap sander. You will quickly notice how the Hitachi works about twice as fast as the cheap plastic versions of a a belt sander, saving you time. I see many reviews are of people complaining about belt sanders and how they can gouge the wood, are noisy, creates dust, etc. Those are all true, but those are characteristic of all belt sanders. Belt sanders are meant to be aggressive to remove lots of material quickly. 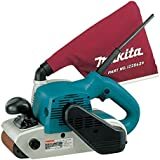 With the correct technique and practice, you can achieve very smooth and flat results, but a belt sander is still not a finish sander. 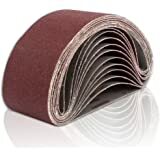 The design of the belt sander leaves scratch marks in the direction of the belt travel, and this can't be avoided, only minimized by using fine-grit belts. To finish-sand wood that you intend to stain and polyurethane, I strongly recommend using a 1/4 sheet palm sander after the belt sander to remove the scratch marks. Wished I had found it sooner. Used it for the first time today for about four hours. Heavy duty construction. Belts track very well with minor occasional adjustments. The sander dust bag works very well. The sander exceeded my expectation. Just a note, we have purchased two other belt sanders (made by other manufacturers) in the last six years. It did not take long before we were unhappy with both of them (belts didn't track well or tended to catch and shred; sanders didn't collect dust well, etc. It is already obvious the Hitachi surpasses their performances. I bought this in March 2018 and have used it a total of 2-3 hours since then. Unfortunately, the last time I tried to use it (Dec 18), it kept shredding belts. I am a longtime woodworker who knows how to adjust and maintain such a tool and no matter what I did, the shredding continued. I wrote Hitachi. The response was, I could mail it back to them in Georgia or find a service provider that could verify the damage. I found a service center but when I called, they told me Hitachi should be handling this via their warranty center directly. Given this I will trash this junk and buy a Dewalt or Milwaukee unit. Never had trouble with those brands.